I had the opportunity to attend THON 2014 to support my sister who was dancing that year as a representative of Penn State Law. I was in awe at the passion and energy surrounding such an incredible organization and the following year started a Mini-THON program at my high school. What are your main duties as the Development Director for THON 2019? 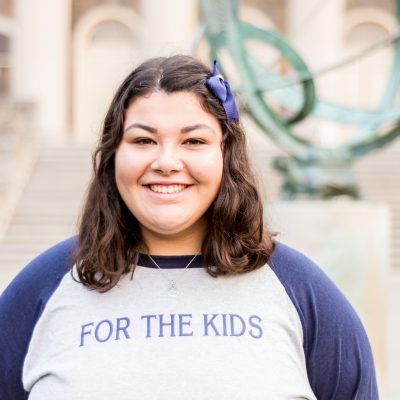 As the Director of Development, I am primarily responsible for fostering relationships with THON’s growing donor base and empowering all volunteers to take action in the fight. The Development Committee oversees the distribution of THONvelopes and Corporate Packets, serves as liaisons to all student organizations, and manages THON Nation, THON Weekend tours, and donor stewarding and benefitting. As part of the Development and Alumni Relations Committee, we work closely with Alumni Engagement on collaborative efforts to connect with supporters across the country. Last fall, I was lucky enough to be able to visit the Hershey Medical Center for a tour. One of the first things we got to see was a young boy ringing the end of treatment bell and filling shadow boxes with glitter that spelled out the word “inspire”. We spent the rest of the day getting to know Four Diamond families and staff, and watching the Halloween parade. That day was my first time at the hospital. The experience grounded me in our mission and efforts in a way that I will never forget. Also-- as aforementioned, my first time at THON was to support my sister. This past year, I was able to return the favor and invite my older and younger sisters to spend some time on the floor Saturday night. Getting to share that experience with them was very meaningful to me and we were able to reflect on the past 4 years since the last time we had all been together in the BJC. Although I am not able to be as active anymore, I am at heart forever a proud Springfielder. During my freshman year, I went on my first Fundraising Outreach and Canning Weekend, camped out at Nittanyville, welcomed a new family to the organization, and was even a Dancer Relations Committee Member for one of their organization chairs. Springfielders demonstrated to me what it was like to show a selfless, passionate love for something in a way I had not seen before. I was introduced to some of the most incredible people and families that I will ever know, and I am extremely thankful for all of the experiences I had with Springfield.